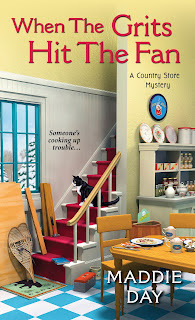 Robbie Jordan here, from Maddie Day's Country Store Mysteries - with an audiobook giveaway! I've been thinking a lot about grits lately. They're just so dang good. I mean, who doesn't like a creamy starchy delicious pile of grits for breakfast, preferably with a pile of cheese mixed in? My customers kind of demand high-quality breakfast food though, and I realized I didn't know where the grits came from. What kind of corn is used, and who grinds it into those little bits? Then I came across the Original Grit Girl. She's a woman my author used to know in Bloomington. She's got a real name, sure, Georgeanne Ross. after I sampled some, I'll tell you, I was hooked. She's just down in Oxford, Tennessee, not all that far from here. She makes grits, masa, cornmeal, and polenta and it's all delicious. You should order some up! My author included The Grit Girl's recipe in When the Grits Hit the Fan - with permission, of course. 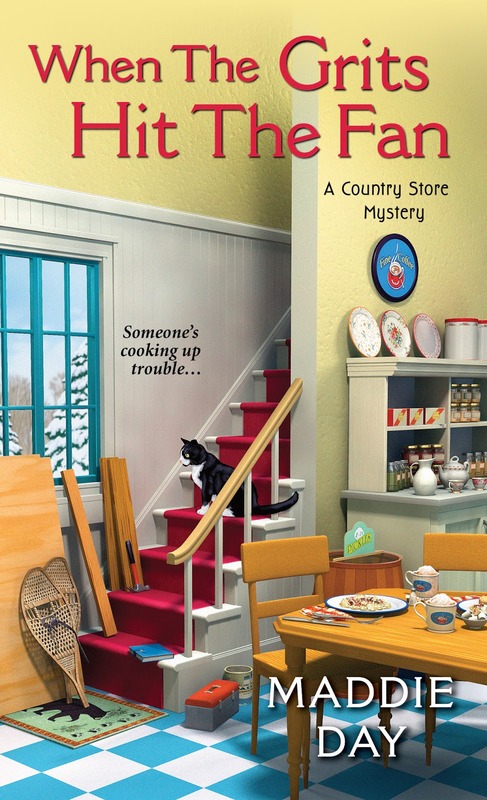 To celebrate how great grits are, we're giving away an audiobook version of Grilled for Murder! And if you don't win, the ebook versions are on sale right now. Love grits and country stores!!! Looking forward to reading this series!!! Nice!!! I can't believe that you have time to write so much. You must be an incredible multi-tasker. Sounds interesting! Love country cooking and stores! Thanks for the chance! I'm from Indiana where corn is a staple in our diet. An audio book is great! As I grow older, I find I cannot read for as long as I used to. I using audio books more. Love this series. And off to make some grits now! Thanks for the giveaway, audiobooks are great for my daily walk. I've had grits from a Quaker packet... And I'm not talking about Rose! Let's just say it wasn't my favorite. I think I need to seek out some grits done right! Thanks for the audio giveaway! I haven't eaten grits, being from Michigan and you don't see grits on the menu. I will have to give them a try. This is a great series and would enjoy having one of the books on audio. I've tried grits. They not my cup of tea. But I'd like to read about them. I've never tried grits. Odd since I grew up in the south. Thanks for the chance. Thanks for the opportunity to win...not sure about the grits. We don't eat much of them in Ohio. I love grits! This recipe seems easy, too. I'm also getting to like audiobooks, too. Thanks for offering a fun opportunity. I LOVE grits, thanks for the recipe and a chance to win. I eat grits all the time...very Southern thing and they are good. A Friend's Husband does the cheese ones. Thank you for the contest. 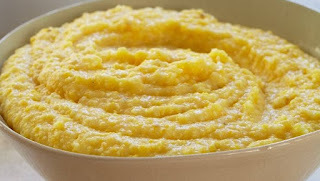 I love cooked corn meal for breakfast, but have never had grits. I must now try them. Thanks for the contest. The wonderful corn people you reference say they are only wholesale. My spouse loves grits. With me, it depends on the grits. I love grits! I'm starving now. Thanks for the chance to win! I have never eaten grits and never made them for my kids nor has my husband. I am so glad that you have a new book out since i am disabled not able to do ebook or audio but i will put it on my to buy list and when i am done i will review at 2 or more sites. Love the books that you write. This s a great series and love the food!! And Barbara Hawk is the winner selected by random.org! Congratulations, Barbara, and thanks so much for your interest to the rest of you. I wish I had a couple dozen audiobooks to give away.